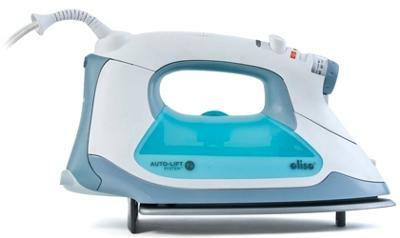 I recently bought the Oliso non-stick steam iron with auto-lift system when my old iron stopped working. The iron that I had previously was just a cheap 20 dollar iron. It was time for a upgrade. I definitely got an upgrade with this iron. First, you are guaranteed not to burn anything. When you are holding the iron it will lay flat on your clothes, but say the phone rings and you step away. As soon as you let go of the Iron it lifts up, with these little feet that it has. It sounds strange but it is a very good feature to have, especially if you have a scattered mind. It also automatically turns off after not using for 8 minutes. Which I love because sometimes when I am on my way to work I will think “did I turn off the iron?” and now with this iron I do not need to give it a second thought. The only negative comment I can make about his iron is that it is a little heavy. I am used to a cheap iron that does not have many features and this iron has a lot of features and that may be why it weights a little more than normal. It’s also a little bulky. The steaming that it does is fantastic. I only really have to pass over each section one or two times and it is perfectly pressed. So in the end its great because it irons great and has a lot of features, the bad things are the weight and size.